There’s something I wanted to say for the past ten months, and I haven’t taken the time to put those words into my Google Docs. No, I haven’t done anything illegal or morally wrong. I did something that I regret with all my heart. I keep all the articles I write neatly organized in a Google Drive folder. I have one for my own site called “Content Fiesta,” one for my guest posts, and the rest for each of my clients. As you may have noticed, I’ve not written for my site in a long time. I published my last article, “How to Hire a Team of Rockstar Writers,” in July 2017. I was disappointed with myself. I started to doubt my commitment to the craft. I looked back to those nine months, and all I saw were some client work, few guest posts (which drove some of those clients), and my traveling experiences, nothing else. “Where’s the passion?” I asked myself. I remembered when I decided I wanted to become a content marketer, and I thought all the great guest posts I wrote. Now, I had little to show for myself. While the self-doubt and sadness I felt made me rethink my work’s purpose, I also started to think about why I stopped writing for myself altogether. “Fear of what?” you must be asking me. I’m not sure, really. Fear of failure is the first one that comes to my mind. Fear of publishing something no one would care about. Fear of being ignored. Fear of criticism. Fear of irrelevance. Fear of mediocrity. I’d like to find a grand reasoning why I stopped writing, but I can’t find any. I just let fear paralyze me. Instead of keeping writing, I over thought my work and let it stagnate. It’s easy to write when you are on a roll, when you have many ideas coming up in your head, and you have the time. Writing for me is fun, it’s something I like doing for its own sake. I’m writing this article because I’m trying to communicate something, and that’s why I like to do. I remembered back in June last year I decided I was going to start writing every day 500 words. And I did it. Every day I’d sit down for 15 minutes and write about a specific topic for my own blog. Each of these articles are at least 3,000 words each. In less than a month, I got to write that much simply by deciding an achievable goal and putting the time into it. If I had told myself I had to write that much, I wouldn’t do it. But by breaking each article down to its minimum output, I was able to create that much content without almost any effort. Then, something happened. Somehow, I lost my motivation to write, not just for myself, but for my clients. While I was going through this low motivation phase, I was happy traveling the world. When I decided I was going to write 500 words a day, I was in Bali, having a great time. Then, I traveled all the way around the world to my sister’s wedding in Calgary. After the wedding, I moved to New York City for a week, and then I went to a small little fishing town in southern Morocco called Taghazout, where I spent three weeks. Then, I spent two weeks in Lisbon, ten days in Las Palmas, and then two exhilarating weeks in the Nomad Cruise. I finished the trip with three days in Panama City, and one month in Medellin. I can argue that one of the reasons behind my lost motivation is that I was distracted. Traveling is fun and it fulfills me, but it can get exhausting to change place every few weeks like I did last year. That’s what I originally thought when I came back to my parent’s house in La Plata. Traveling wasn’t the cause of my distractions. Sure, some days I had a hard time finding the focus to write. But that wasn’t the main cause of my problem. It was something more subtle and important. The reason why I stopped writing with the same passion and curiosity I had previously is because I had stopped reading a lot, and I had stopped writing a lot. I was too focused on my clients’ work and forgot to write for the pleasure of it. All the guest posts I had written before I wrote them to get more exposure and for the ambition of getting published in authoritative sites. Not only I stopped writing for myself, but I also forgot that I needed to get more clients, which would eventually hit me hard. According to Alcoholics Anonymous’ 12-step recovery program, the first step is recognizing you have a problem. Consequently, acknowledging I was afraid of publishing and the reason why I felt that fear was the first step to recovering my ability to publish often. If you also feel like you aren’t publishing enough, and that fear is what’s stopping you from doing so, then you need to learn how to overcome that fear. If you ever feel like you shouldn’t publish a piece of content because you aren’t an expert, you are uncertain whether your readers will like your content, or if you are too busy, the solutions I will provide will help you overcome these issues. The key to lose your fear of writing and find unlimited motivation is simple: you have to constantly read and write. The best way to achieve something consistently is not to think about it as a task or a chore, but rather as something you do every day. Do you think best-selling authors like Malcolm Gladwell, James Patterson, and Seth Godin have to fight against their will to write? Not only they are talented writers who feel an unlimited love for their craft; they write as much as they do because they have a system in place. That system allows them to write every day without having to sweat the work. You can love the experience of writing (although if you do, you’re not a real writer ), but if you don’t make it easy to yourself to write, it will be hard you will achieve the needed consistency. If you want to write every day, make it easy for you to do so. Successful people aren’t more disciplined or smarter than you are. While those two factors play a role in the final outcome of their efforts, they don’t have more willpower than you do. Successful people know how to create and leverage systems to their advantage. Instead of having to think what they’ll do each day, they know what specific tasks they need to do every day that will allow them to get closer to their goals. A system is a set of things—people, cells, molecules, or whatever—interconnected in such a way that they produce their own pattern of behavior over time; [it’s] an interconnected set of elements that is coherently organized in a way that achieves something. I’m not the biggest fan of using deadlines, as most of my personal articles tend to be much longer than I expect. Also, I let myself write as much as possible about each article (which explains my all my articles are over 2-3k words), and then I “kill your darlings,” as Stephen King likes to say. If you still believe talent trump systems, then you need to read the book Daily Rituals. In this book, you will see all creative geniuses had a specific routine where they implemented a specific set of actions (i.e., a system) that allowed them to tap into their creative force. 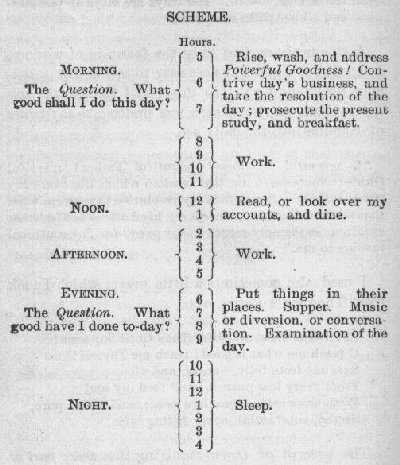 Take a look at Benjamin Franklin’s routine, one of the most productive and prolific men of his time. There is a muse, but he’s not going to come fluttering down into your writing room and scatter creative fairy-dust all over your typewriter or computer station. He lives in the ground. He’s a basement guy. You have to descend to his level, and once you get down there you have to furnish an apartment for him to live in. You have to do all the grunt labor, in other words, while the muse sits and smokes cigars and admires his bowling trophies and pretends to ignore you. Do you think this is fair? I think it’s fair. He may not be much to look at, that muse-guy, and he may not be much of a conversationalist (what I get out of mine is mostly surly grunts, unless he’s on duty), but he’s got the inspiration. It’s right that you should do all the work and burn all the midnight oil, because the guy with the cigar and the little wings has got a bag of magic. There’s stuff in there that can change your life. Create a writing system, and follow it every day, bit by bit, word by word. That’s how you will be able to publish often and grow your online presence. Whenever I write for my clients, I do it with focus and commitment. Not only they pay my bills, I know I have a specific topic I need to write about with a pre-defined deadline. The constraints my clients give me help me to rarely feel lost or confused on the assignment. Yet when I write for myself, I have so many doubts that they paralyze me. In the past 10 months, I’ve felt like I had to write about content marketing topics like an “expert” would. That made me lose all motivation. Worse yet, that feeling of acting like an expert nurtured my fear and paralysis. I was already writing like an expert for my clients; writing like one for myself was too exhausting. I wanted to express the other Ivan, the one who writes like a human being, with his own sets of values and beliefs. Instead of having this conflict of emotions, I decided I needed to go back to my roots. That means, I had to remember why I write in the first place: for fun, for pleasure, and for self-amusement. I don’t need to write yet another tutorial on how to create a content marketing calendar; instead, I need to write about more personal things, the things that interest me. Using the example of the content calendar article, if I was to write it again, I wouldn’t write it like that. That article is too technical, boring, and vanilla to make anyone care about it. It’s not bad per se, it’s simply not great. What I’d do now is make it more emotional, relatable, and personal. For example, I could write an article about how I approach the content calendar for my site. I could also create an opinion article about why you need to plan your content ahead, and what my experience has been with my clients. My blog won’t become another Backlinko, but that’s fine, because it’s not my goal. Instead, my goal is to make it a site where other writers, content marketers, and marketing managers could get unique perspectives on the industry. I don’t feel like I’m an expert at the level of Jay Baer, Joe Pullizzi, or Aaron Orendorff. I’m a content marketer who’s still figuring things out and learning while I make my career and build my craft. That’s my perspective and, in business terms, my unique value proposition. To write often, just like it happens with any other routine, your intent has to come from within. Your motivation must be to write for the sake of it. You can’t force a routine if you don’t truly like it. Writing is a part of me, it’s a way I express myself, and it’s who I am. As anything that comes from one’s self, it’s not just a professional task, but a spiritual one as well. It’s fun, it’s challenging, yet it’s hard to understand. Writing is the biggest passion I know, and the only one that can allow me to make money at the same time. Discover what’s motivating you to write and don’t lose sight of it. That’s the best way to keep you writing consistently. Hopefully, a year from now, I’ll look back and will have been able to overcome my fear of publishing. I know I’m still a long way to go. There are so many things I need to learn. I know they are there; I feel them. Sometimes when I’m writing (like it happened in this article), I say “I’m sure I could make this article more spiritual, or more actionable, or more emotional.” I know I’m still missing the way I can the right angle for the article, the right audience, and the right structure. Nevertheless, I can’t let that stop me from creating content. It shouldn’t stop you either. If you are in the same position as I am right now, then I can only tell you one thing: keep creating whatever you create. If you are a writer, keep writing. If you are a video producer, keep shooting video. If you are a designer, keep designing. Be conscious of what you don’t know and what you need to improve. Each time you create something, focus on how next time you can make it even better. Look back at your previous work and learn from it. Do it with focused attention, slowly, brick by brick, and step by step. Don’t let your doubts and fear stop you from building your craft. You can let it take you as far as you want it to. Let’s make it take you further away.